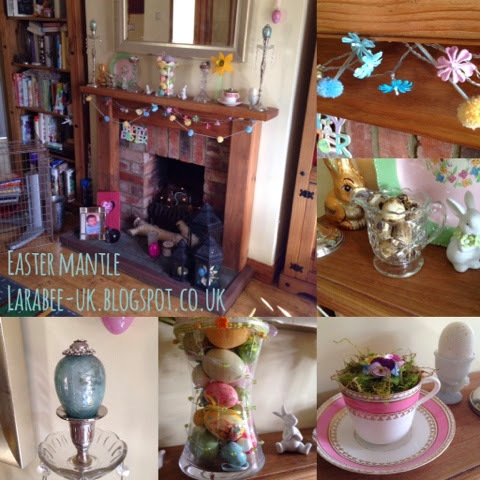 This year I wanted a bit of a change for our Easter mantle, I decided a while ago that I wasn't going to use the twig 'tree' I used last year that hubs made me a few years ago and that I wanted our eggs piled in a vase. This particular vase already had ribbon attached to it from another project so, just a bit of Easter ribbon round the top and I was good to go! 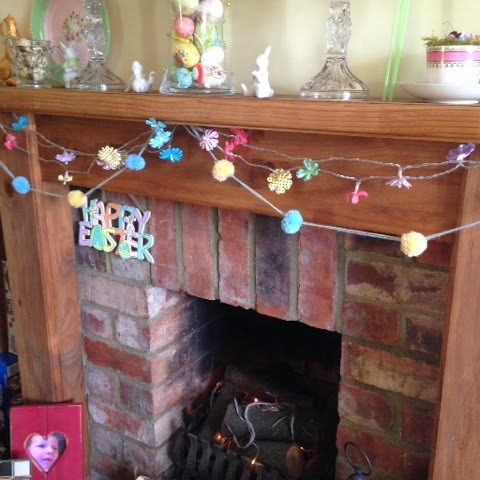 Rather than risking another accident with my gorgeous glass eggs, I put the blue ones on the candlesticks and threaded the lone pink one onto ribbon and hung that up, I'm not sure yet what I'll do with the green ones! I put a small china brooch that my grandma gave me, onto some moss in a pretty china teacup, I love it and this will stay all spring. The ceramic rabbits are back and the bunny plate is back, but this year I've put the blown quails eggs in a pressed glass jug for something a bit different. 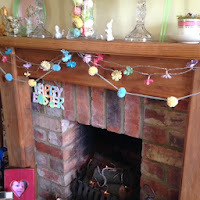 I made a little garland with the fork pom-poms I made last month, I'd have liked more colours but I ran out of wool and time, so just went with what I had, I do hope to add more colours and re-do the garland soon. My little flower led lights finished it all off nicely and make it all look pretty! A lot of this mantle will stay after Easter and into spring, I love the simplicity so much.